Education is where you find it, and as an indolent nerd growing up, I learned a lot from gangster movies. I found out about safe houses, and how to get rid of your victims, and exactly how RICO predicates work. But along the way I also learned some very useful cooking tips. Here, the five best. Nicky Santoro, the profane madman played by Joe Pesci in Martin Scorsese’s underrated masterpiece, is completely right here. High-end Italian restaurants then and now consider themselves to be judged by their veal; one need look no further than Carbone, New York City’s hottest Italian restaurant, whose signature dish is a massive veal chop of surpassing tenderness. What Santoro calls “pink veal” is in fact less tender than “milk-fed” veal. Of course, being a brutal gangster, he is indifferent to the fact that the white veal he prizes is a result of starving baby animals; the “pink” veal is what their flesh looks like when they are actually allowed to eat. And of course, the whole speech is just a line of patter meant to coax a buxom showgirl into his car. Clemenza, the portly caporegime of the Corleone family, is probably best remembered by foodies for his immortal line, “Leave the gun. 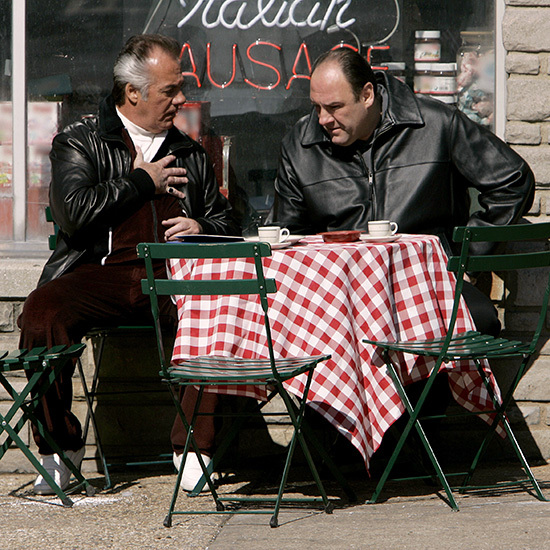 Take the cannoli.” But as advice, that one is less than useful. Whereas the lesson the lovable Clemenza gives a young Michael Corleone is not only easy to follow, but also totally effective. Although it would have been better if he had put the sausages in first. That way the pork fat would have flavored the tomatoes. The masterful technique used by Paul Sorvino’s not-really-that-menacing mobster in his prison cell has become so universally revered that it has passed into the cooking world. New York’s Andrew Carmellini, a best-selling cookbook author, has even gone so far as to specify garlic “cut Goodfellas thin” in his recipes. This one isn’t so much a piece of advice, as a poignant moment to remember when you get depressed about food. The Sopranos “Luxury Lounge” episode centers on chef Artie Bucco, Tony’s boyhood friend, who goes off his rocker when Nuovo Vesuvio struggles. Artie becomes a preening, obnoxious boor, so much so that has to get a moral wake-up call from Tony, of all people. The show ends with the chef finding himself by cooking his grandfather’s braised rabbit recipe one-handed; like Game of Thrones’ Jaime Lannister, he only finds his soul after losing his hand. Josh Ozersky has written on his carnivorous exploits for Time, Esquire and New York magazines; he has authored several books, including The Hamburger: A History; and he is the founder of the Meatopia food festival.